The U.S. Space Agency, NASA, released long-awaited photos from its New Horizons mission that show icy mountains on the surface of Pluto. Scientists also revealed images that show remarkable new details of Pluto's moons Hydra and Charon. U.S. scientists released photos Wednesday after an unmanned NASA spacecraft whizzed by the distant dwarf planet following its nearly 10-year journey of 4.8 billion kilometers (nearly 3 billion miles). The nuclear-powered New Horizons – moving faster than any spacecraft ever built previously, at a speed of about 49,570 kilometers per hour (30,800 miles per hour) – snapped pictures of Pluto as it hurtled by. Pluto nearly fills the frame in this image from the Long Range Reconnaissance Imager (LORRI) aboard NASA’s New Horizons spacecraft, taken on July 13, 2015, when the spacecraft was 476,000 miles (768,000 kilometers) from the surface. ​The photos reveal details of the planet never seen before. To the scientists' great surprise, there are no impact craters. On Charon, deep troughs and canyons can be seen. Scientists said the mountains, most likely composed of Pluto's water-ice "bedrock," were probably formed less than 100 million years ago and may still be in the process of growing. "This is one of the youngest surfaces we've ever seen in the solar system," said Jeff Moore of New Horizons' Geology, Geophysics and Imaging Team (GGI). Scientists said that Pluto cannot be heated by gravitational interactions with a larger planetary body, which is how mountainous landscapes are generally formed. "This may cause us to rethink what powers geological activity on many other icy worlds," said GGI deputy team leader John Spencer. NASA reveals new close-up images of a region near Pluto’s equator reveal a giant surprise: a range of youthful mountains, July 15, 2015. 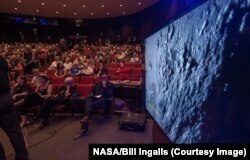 Especially astounding to scientists was the absence of craters. They said that suggests to their surprise that Pluto is geologically active even now, and is being sculpted not by outside forces but by internal heat. "I don't think any one of us could have imagined that it was this good of a toy store,'' principal scientist Alan Stern said at a news conference. 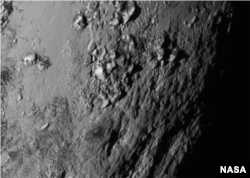 The long-awaited images are being released after being downlinked from New Horizons. "Sending back 'first-look' data to the team 'down under,' " the New Horizons team tweeted Wednesday, indicating its space antenna in Canberra, Australia, was receiving information from the craft. The mission completes the exploration of the solar system, and it makes the United States the first nation to send a space probe to every planet from Mercury to Pluto. After a long day awaiting New Horizons' fate while the spacecraft was out of radio contact, mission controllers at the Johns Hopkins Applied Physics Center outside Washington, D.C., were finally able to exhale late Tuesday, 13 hours after the flyby. Applause broke out as the spacecraft made its "phone-home" contact with Earth and all systems were reported intact. "We have a healthy spacecraft," said mission operations manager Alice Bowman. "We are outbound from Pluto." The confirmation calmed nerves among scientists who were waiting all day to find out if the $700 million New Horizons survived cosmic debris in the Kuiper Belt, the region beyond Neptune that is similar to the asteroid belt, but about 20 to 200 times as massive. "Once again we have achieved a historic first," said NASA Administrator Charles Bolden. "The United States is the first nation to reach Pluto, and with this mission, we have visited every single planet in our solar system." New Horizons media briefing shows some of the first data and images collected since the spacecraft's fly-by of Pluto, at the Johns Hopkins University Applied Physics Laboratory (APL), Laurel, Maryland, July 15, 2015. "NASA as an agency is on a journey to Mars with other agencies around the world," Bolden continued. "Today's mission was just one more step on the journey of getting humans to Mars, because it gives us one more piece of the puzzle about our solar system." 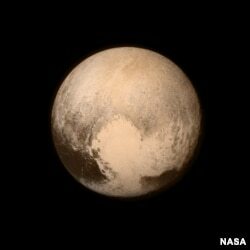 The New Horizons team also announced it was naming the "heart" shape on Pluto's surface, Tombaugh Regio, after Clyde Tombaugh, the discoverer of Pluto. Mark Snowiss contributed to this report.